RESEARCH AT RISK – WHAT DOES THAT MEAN TO YOU AND ME? Here is an article I just wrote for Isthmus, a Madison, WI, weekly newspaper. WHERE HAS ALL THE RESEARCH GONE? Federal Cuts Threaten Research at UW-Madison. This situation isn’t confined to Madison. It’s easy to take the benefits we all receive from scientific research for granted, but we do so at our peril. University of Wisconsin researchers are laying the groundwork to make it possible to “print” new transplant-ready organs, grown from cells cultured from a patient’s blood sample. This project, which merges research in biotechnology and nanotechnology, is under way today thanks to funding from the National Institutes of Health (NIH). Over at the Wisconsin Energy Institute, scientists are developing improvements to the electrical distribution grid that will seamlessly integrate renewable and traditional energy sources. The research is being done thanks to Department of Energy funding for the Power Systems Engineering Research Center. 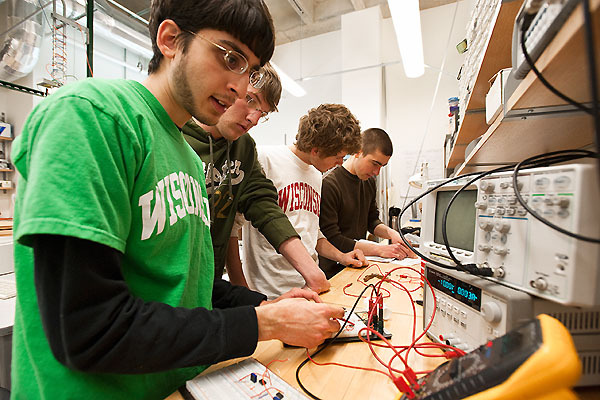 Students (from left to right) Andrew Dias, Jeremy Schaefer, Andrew Bremer and Jeremy Glynn work together to create a low-cost spirometer in the Engineering Centers Building at the University of Wisconsin-Madison . The device is used to measure lung function and could be used in low-income countries to diagnose and manage respiratory disease. The work is part of a Biomedical Engineering Design class project designed by postdoctoral fellow David Van Sickle. 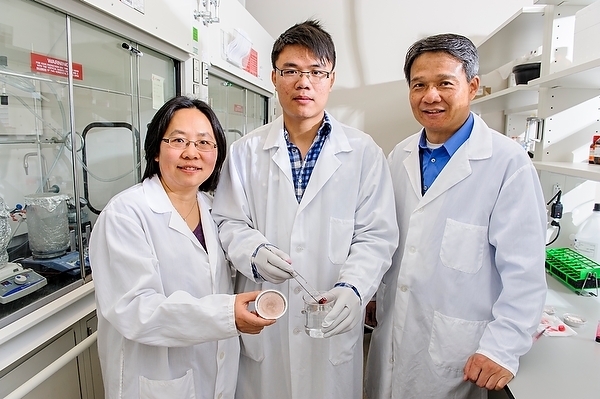 Just a short walk over to the chemistry department, researchers are addressing the threat that strains of harmful bacteria present as they become increasingly antibiotic-resistant. What they are learning may become a next-generation line of defense against serious infections. This promising research is also being funded by the NIH and the National Science Foundation (NSF). But ongoing federal research funding cuts could turn the lights off in these university labs. The jeopardy is real because of the Budget Control Act passed by Congress and signed into law by President Barack Obama in 2011. Across-the-board federal spending cuts known as budget sequestration took effect March 1, 2013, and slashed 5%, or $1.55 billion, of the annual NIH budget alone. The NIH is the primary federal agency charged with conducting and supporting biomedical and behavioral research. Similar cuts affected other funding agencies, and ongoing reductions of as-of-yet-unknown and varying amounts are targeted for budgets through 2023. Approximately 640 fewer competitive NIH research project grants were issued in 2013 to universities, medical schools and other research institutions across the nation as a result, and UW-Madison has taken its share of the pounding. In 2009-10 the campus received $798 million in federal research awards. In 2012-13 that amount had shrunk to $620.4 million. 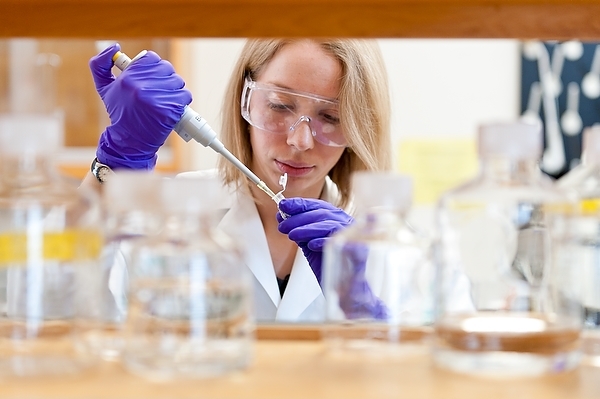 Research expenditures at UW-Madison total more than $1 billion annually. The money is spread throughout the campus. 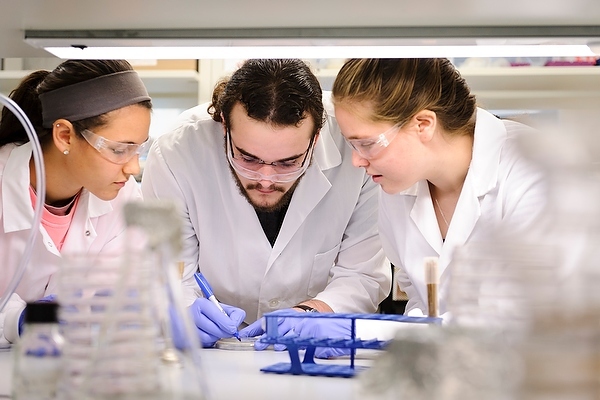 In addition to funding individual research projects, it supports some core research facilities that bring together expensive technology, like high-end imaging microscopes and clean-room facilities that would be outside the reach of any individual lab. “It’s an efficient way to provide expertise and equipment to many research teams without having to duplicate,” says Marsha Mailick, vice chancellor for research and graduate education. 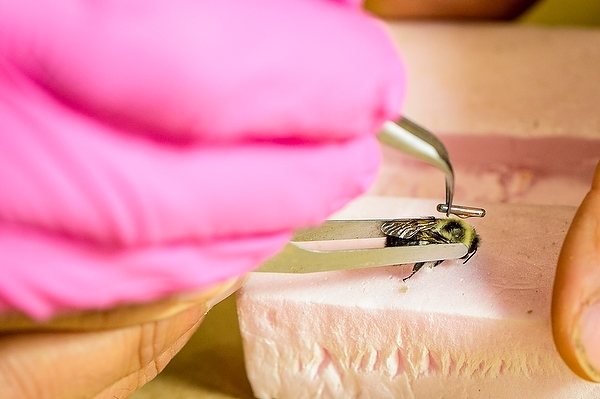 The biological sciences rely heavily on funding from the NIH and the U.S. Department of Agriculture. Physical sciences rely on the National Science Foundation and other federal agencies such as the departments of Defense and Energy. Many social sciences rely on federal dollars from the Department of Education, NIH and the National Science Foundation. Some of the social sciences and humanities have less access to large federal granting programs. Mailick is worried about how cuts today will diminish not just the university, but the wider community. “This affects so many areas of our society and so many things we all care about. “We have the Internet today because of research done several decades ago. We have federal policies about water quality and air pollution because of studies that were done here and elsewhere that led to our understanding of how to preserve our natural resources. We have diseases in the history books like polio that no longer threaten our communities. It’s a shame that the federal government hasn’t controlled it’s spending in over 50 years and now we are robbing Peter to pay Paul with money that has to be borrowed. I agree research has to be funded but at what cost? What do we stop paying for in order to pay for the research? Also people (myself included) are getting tired of hearing about the research funding that is frivolous and serves no common good. Who cares what affect rock music has on crickets? Thanks for your thoughts, Dan. I’m not sure how to reply to your reference to rock music and crickets, except to say you may want to check your sources carefully on topics like that. There are so few funds and so much competition for them that each proposal must justify itself very thoroughly and may still not get funding. I had so much more information in my notes for this piece than I could use. One area I would have love to have covered was the way that research feeds the local economy. A lot of the funds pay for researchers who then spend their wages supporting local businesses. A lot of it goes for equipment and supplies that are produced by businesses who can hire employees with the money they are paid from research grant funds. Many people outside the university owe their livings to the funds that researchers generate. Losing research funding not only hurts society because of the benefits that will not be developed if the research stops, but it is also a very basic bread and butter matter for all the people and industries that supply research efforts. This is a dynamic that often gets overlooked.